Manufactured from a range of materials, including stainless steel, mild steel, polyester (GRP) and depending on quantities cast Si 12 alloy die cast aluminium. Various paint and non painted finishes. Optional extras include: viewing windows, doors, shelving, internal compartments, OEM labelling, heaters, fans, thermostats, floor stands and plinths, lifting eyes and many more. CE-TEK enclosures are designed to meet the highest standards for equipment protection with ingress protection levels: IP65, 66, 67, 68 and 69K. 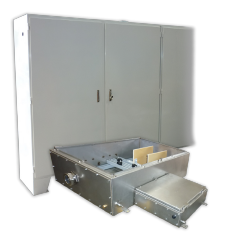 CE-TEK custom built enclosures are manufactured from a wide range of materials, including stainless steel, mild steel (with a powder coated finish) and GRP. 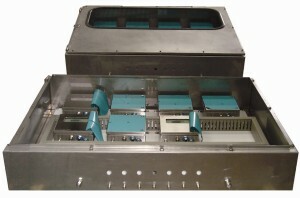 CE-TEK custom built enclosures are often specified by engineers and designers when their project or installation requires a robust enclosure that will withstand harsh environmental elements and temperature extremes, which affords minimal post installation intervention and maintenance. CE-TEK enclosures are purposefully designed to meet these demands and can be found on oil and gas installations and other hazardous sites worldwide. CE-TEK’s flexible ATEX/IECEx certification provides a wide scope for manufacturing various standard and non-standard sizes, for example CEX enclosures up to 2000x2000x600mm. Available with ATEX 2014/34/EU Directive Ex e, Ex ia and Ex ib certification and a temperature classification of T5 or T6. CEX enclosures are also available as fire rated versions to BS5839-1: 2013 (970ºC for 2 hours), IEC331 (750ºC for 3 hours) and to BS6387 CWZ (950ºC for 3 hours). AC-AlSi 12 (Fe) aluminium, polyester (GRP), mild steel and 304L/316L stainless steel.